Epic free concerts are synonymous with summer, and none do it better than the TD Vancouver International Jazz Festival. Notorious for their Downtown Jazz Weekend, in many ways this is festival season’s official kick-off. This year, the beat is strong with a full lineup of bands across three different stages, as well as an interactive art exhibit. The festival also includes an artisan market, food trucks, two licensed bistros, and a family fun zone. It also marks the first occasion where Downtown Jazz Weekend has been expanded to include Thursday and Friday. It’s the perfect excuse to start the weekend off early, or enjoy some stellar live acts on your (extended) lunch break. 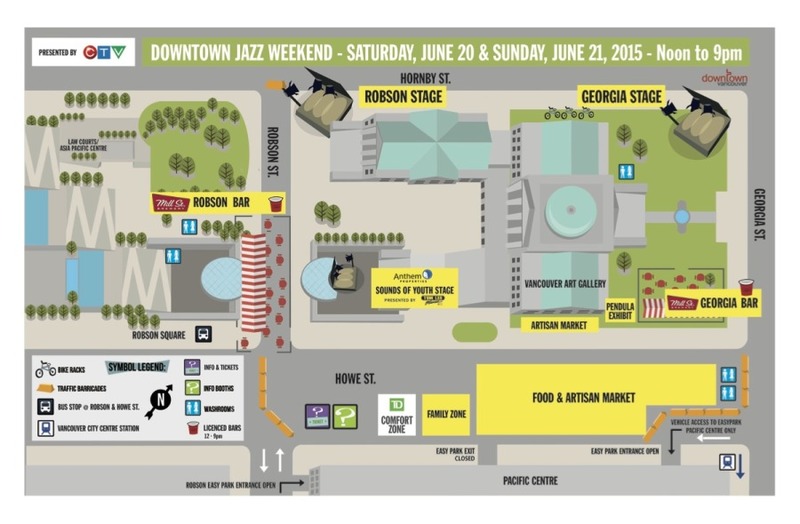 For a full layout of all Downtown Stages, see the map at the bottom of this article. When: Saturday, June 20 to Sunday, June 21 at 4 to 8 p.m.
Utilizing swings, sensors, sound, visual projections and programming, Pendula is the brainchild of Vancouver based creatives Nancy Lee and Kiran Bhumber. In Pendula, Lee and Bhumber stage an inhabitable synthesis of technology, movement, and social space by connecting swing sets with a responsive audio-visual apparatus, generating an installation which participants both occupy and co-create. Pendula plays with nascent ambiguities in our definitions of power and agency in the shifting context of digital worlds’ proliferation and integration into physical and social spaces. 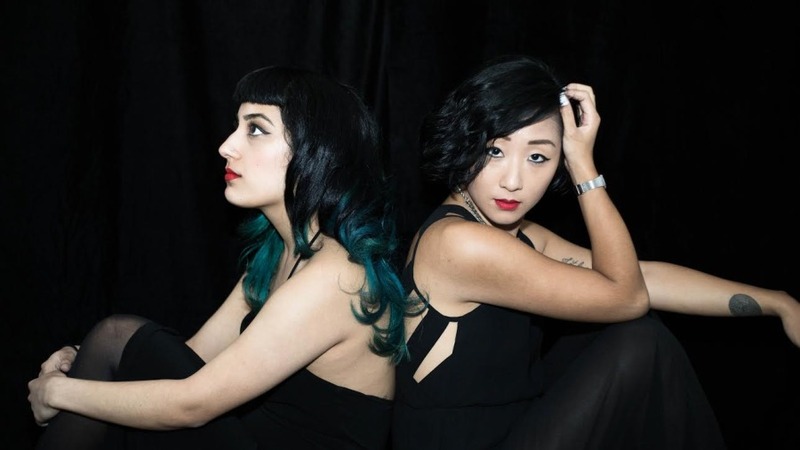 A special adaptation of Pendula has been created for this year’s Festival and will feature 10-minute musical performances featuring Neelamjit Dhillion and Clara Shandler. There are so many great bands that you’ll need a good list to keep you organized! Download PDF versions of the concert schedules and venue maps online, or pickup a Festival Guide. Or, you know, you could just show up and wing it. From Saturday, June 20 (6 a.m.) until Sunday, June 21 (midnight), Howe Street (between Georgia and Robson) is closed to traffic. Access to Pacific Centre/Easy Park remains open at all times. Transit routes along Howe Street will be affected, some of which will be re-routed to Richards Street. The details of transit route changes will be forthcoming. Robson Street summer closure between Howe Street and Hornby Street will be in effect Friday, June 19 (6 p.m. onwards). Concert goers are encouraged to walk, bike or use public transportation.